This article is written by Mr. Ashok Kumar Bayanwala and examples are from his own collection. This article was earlier published in GPA News and later it was made available on the website www.indianphilately.net with the permission of author. 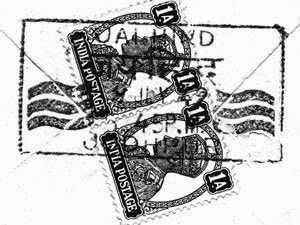 Once again for collectors of Modern Indian Postal History, I am publishing this article on this blog with permission of author. The Freedom Struggle actually began after 1905, when the Britishers partitioned Bengal. Boycott Movement started. In December 1906 a tricolor National Flag was unfurled for the first time at Calcutta Congress. The Revolutionary Movement spread throughout India. The British Government launched assault on the Indian National movement. In August 1920, Gandhiji launched a Nonviolent and Non Cooperation Movement. In December 1929, the resolution for Complete Independence was accepted at Lahore Congress and it was decided to celebrate 26th January every year as Independence Day. Gandhiji launched Civil Disobedience Movement with Historic Dandi March on 12th March 1930, which shacked the British Empire. When the Cripps Mission failed, the country began to prepare for a final confrontation with British Imperial Power. On 8th August 1942, the Quit India Resolution was passed and the clarion call "DO or DIE" was given by Gandhiji. Some 60,000 people were arrested and more then 10,000 people were killed, when ruthless repressive measures were taken by British Army and Police. In 1943, Netaji S. C. Bose organised "Azad Hind Fauj" from Indian Prisoners of war by Japan and launched an attack on India through Imphal. On 29th February 1947, the Britishers agreed to transfer power to responsible Indian Hands. The long awaited Freedom of India came on Midnight of 14th - 15th August 1947. Due to paucity of time at their disposal, the Department of Posts could not come out with a Postage Stamp. But several labels, privately printed, were issued to celebrate the event. "Let's March on" label with Gandhiji, along with nine different labels in ten different colours were printed by New Jack Printing Press, Prabhadevi - Bombay. Thus 100 different labels are in this series. Beside these labels, many others were also issued. To celebrate the attainment of Independence, the Indian Post & Telegraph Department introduced a Special post mark and/or a slogan on 15th August 1947, reading "JAI HIND", in bilingual from all major post offices of India. “JAI HIND" was the first commemorative post mark of Independent India, which was actually a war slogan of Netaji Subhash Chandra Bose, the Supreme Commander of the Indian National Army which was adopted by Free India as National Slogan of the country - Bharat. A close scrutiny of this slogan post mark, reveals that the cancellation was produced locally by the post office concerned from a master drawing. The alphabets of the word "JAI HIND" in English and Hindi, varies from 61mm to 67mm, and the width varies from 11½mm to 15mm. There is something more in this slogan, which has attracted me. After checking/collecting 100 of this slogan, I have came to a conclusion that this post mark was withdrawn on 31st December 1947. And it was reintroduced from Girdikot P.O./Jodhpur for the first time in June 1948. That is why, this post mark, found after 31st December 1947, are mainly (say more than 95%) are from this post office only, and the remaining 5% are the late use of the post mark. The late use of any post mark can not be ruled out as it was done at the whim of Postal Clerks. We even find early India cancellations of the 19th Century on Independent India stamps. Another interesting finding is pointing towards a fact that this slogan was withdrawn from Girdikot (which was the second main PO of Jodhpur) in April 1949, but reappeared in June 1949 in a new format from Jodhpur PO the new format is in a rectangular box measuring 51mm x 26mm and also reads "JAI HIND" in English and Hindi in two lines, with date, time and place in 3rd, 4th and 5th line respectively. The time and date are flanked with 3 wavy lines on each side. It was also used as a canceller. It remained in use until November 1955, according to my collection. My collection of this post mark reveals that this slogan was used from the different Post offices/towns. "Jai Hind" Slogans were used from the following Post offices/towns. 3. Amritsar 65 12 ? 7. Barrackpore 62 11½ ? 10. Bijapur 64 14½ ? 12. Bikaneer 62 13 ? 19. Delhi 65 14 ? 28. Hoshiarpur 64 13 ? 38. Neemuch 64 14 ?? 47. Saugor 64 12 ? It is a pleasure to visit this new Blog. Articles are very informative and the design of the blog is beautiful ! !